Last week, after completing the blessing for installing a mezuzah, I decided to follow it with the traditional blessing for the home, the Birkat HaBayit. This brief blessing is usually found on decorative plaques or hand-shaped hamsas (amulets) near the entrance to Jewish houses worldwide. It is meant to drive evil spirits (negative emotional projections) from the house and to protect the individuals residing in it. Such items are often given as gifts to one who has just moved into a new house. Since the text of this blessing is commonly presented on a ceramic tile or other surface enhanced only by pleasant floral or geometric decorations, I wanted my interpretation to be something more; to reflect additional levels of meaning in the text. In the initial research phase of my illustrations, I often leaf through my collections of aphorisms and quotations for my first clues in understanding the subject of my work and the direction I will take to develop it. These comments are never interpreted literally; they only serve as metaphorical touchstones, suggesting levels of meaning in that subject which invite visual interpretation. Ok, I thought, that’s a powerful idea; but do these qualities also define a ‘home’? Generally speaking, yes. But having visited the homes of many friends and acquaintances around the world, each with its unique flavor and ambiance, I’ve learned that the difference between a house and a home is subtle, yet tangible. Beyond its physical structure and plain or beautiful interior surroundings, a house that can be called a home glows with an aura of peace, laughter and love. These qualities color its walls, furnishings and inhabitants in a way no skilled decorator can truly emulate. The desire for a home of one’s own is universal to all species on this planet from the ant to the elephant. It’s first cultural documentation among humanity quite likely originated in the tale of Adam and Eve whose first ‘home’ was the Garden of Eden, the womb of our world, so to speak. Even as the story relates their shock and fear upon exile from this holy place, the budding comprehension of their newly bestowed mortality soon becomes the powerful desire for shelter and stability in the chaotic world beyond Paradise. Though the Torah offers many other examples of our developing survival instinct from Noah’s post-diluvian resettlement to the long quest for a Jewish homeland, one of the most picturesque appears in in the Book of Exodus (Shemot Parashat T’rumah 25:8-9). Here, G-d requests that Moses establish a sanctuary of a very specific design for the Divine Presence in the earthly realm so that “I may dwell among them (you).” It would seem that even the Source of all Life has need for a place to call ‘home’! After much consideration, I decided to model the house in this illustration as an idealized amalgam of residential architecture drawn from several areas around Jerusalem because it is the spiritual home for so many of us. 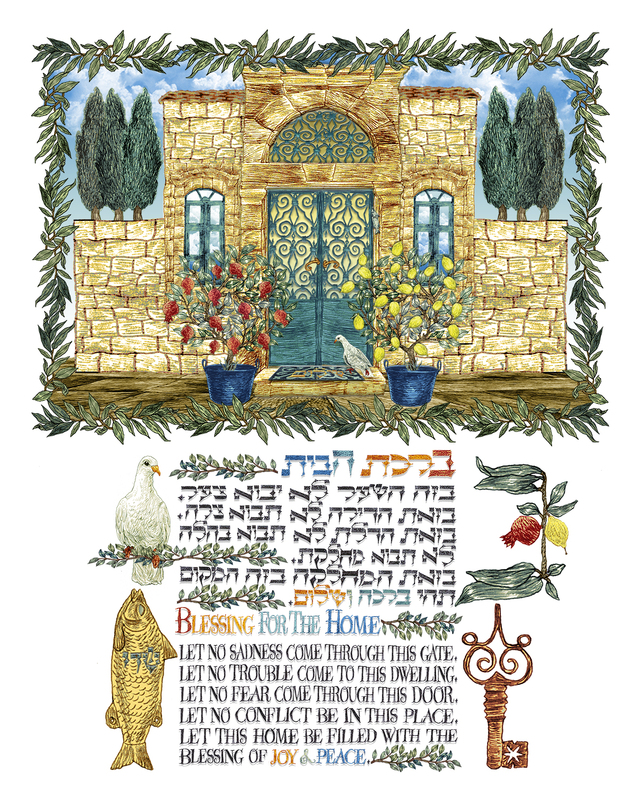 The pomegranate and etrog (citron) trees flanking the doorway are metaphors of beauty, good health, fertility and mitzvot or good deeds that one would wish for the residents of the house. A midrash or commentary suggests that the pomegranate contains 613 seeds, a number equivalent to the categories of mitzvot incumbent upon us to perform in our lifetimes. The etrog, one of the four species honored on the holiday of Sukkot, symbolizes our connection to G-d through our hearts. The cypress trees and the doves are symbols of sacrifice, but rather than the sacrifice attributed to religious ritual, mourning or death, I included them because sacrifices must be made on many levels by all within a household to insure peace and stability. 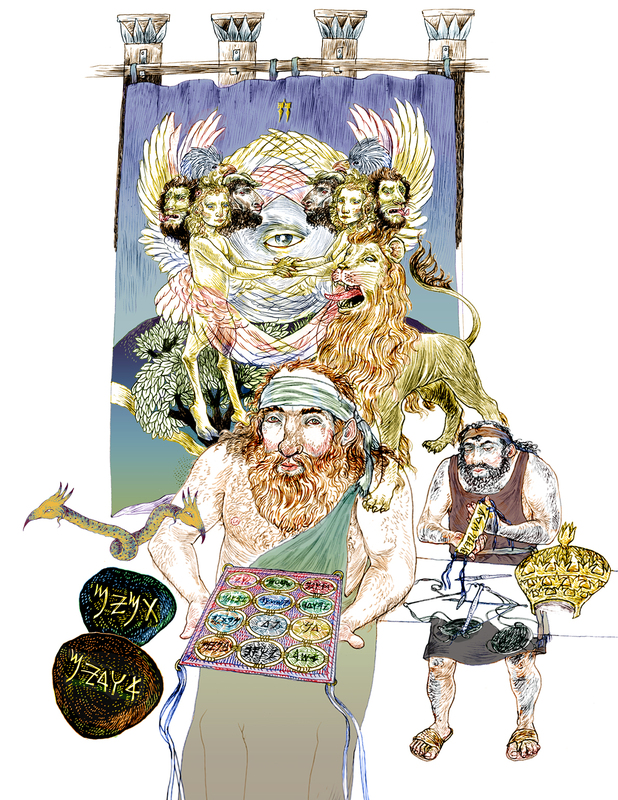 The Hebrew letter bet is included in this illustration for several reasons. First, its original form in the proto-Semitic languages of the Middle Bronze Age resembled a tent-like shelter or ‘house’. Second, it begins the Torah with the word B‘reshit (In the Beginning) and represents the dualities that define Creation (dark, light, good, evil, male, female, etc). Third, bet begins the word ‘baruch’ for blessing. I formed this letter from the leaves and fruit of the fruit trees for the same reasons the trees themselves were included, but also because in a sense, trees were the prototypes of shelter from weather and predators. Finally, the antique bronze key is shown here because with it we enter the idea that when a house becomes a home, it also becomes a metaphor of memory; a repository of touchstones that connect us to ourselves, to each other and to the larger world beyond our doors. Although each of the Torah’s fifty-four parashiyot contain stories and precepts that are meant to guide us in living and working towards our spiritual and cultural fullfilment, it is this week’s reading, Parashat T’rumah with its intricate, symbol-laden descriptions of the desert tabernacle that resonates with especial clarity for me as a visual artist. 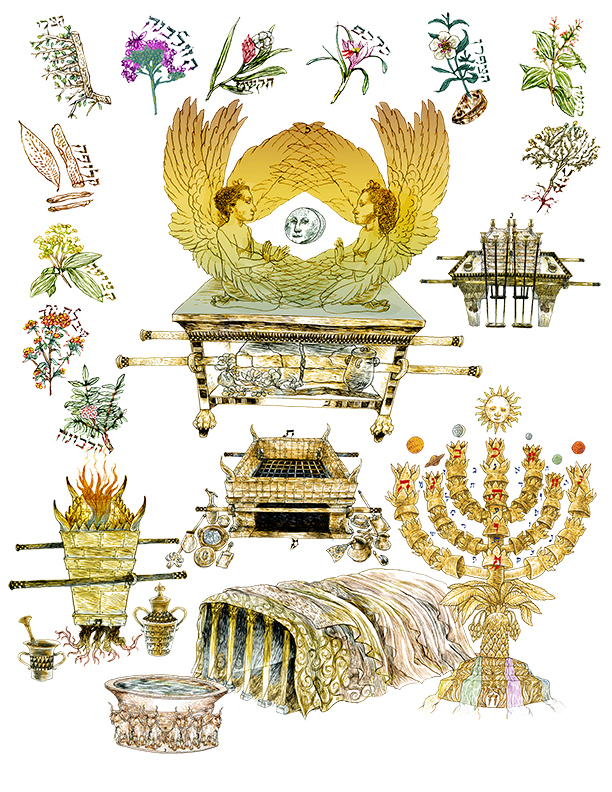 In my book, Between Heaven & Earth: An Illuminated Torah Commentary (Pomegranate, 2009), Parashat T’rumah is illustrated with a double page spread depicting the various implements and ritual objects prescribed for use in the sanctuary. The images shown here are selected details from that illustration which appears on pages 54-55. Entitled, ‘As Above, So Below’ it draws inspiration from the eponymous alchemical maxim referring to the dual concepts of the heavenly sanctuary shown to Moses on Mt. Sinai and the earthly sanctuary that the people were required to build so that God would have a place to ‘appear’ among them. A detailed description with footnoted references may be found in the AfterImages section of the book on pages 149-150. Signed copies of Between Heaven & Earth: An Illuminated Torah Commentary ($36.00+Shipping) may be ordered at: http://www.winnlederer.com or by email from: ilene@winnlederer.com. Allow up to one week for delivery in the US; if required sooner for a gift or special event, express services are available. For organizations, the author is available for on-site presentations of the book’s creative process and book signings. Despite my conviction that works of art and literature, always contain the potential to become a work in progress, I am invariably surprised to find proof of this continual process of awakening and learning. Tomorrow, as we begin the Book of Numbers (BaMidbar), it is nearly three years after the publication of Between Heaven & Earth: An Illuminated Torah Commentary (Pomegranate, 2009). Though I created illustrations for Parashat BaMidbar based on narrative with some artistic license, I recently wondered why Parashah BaMidbar (In The Desert) was designated as the Torah reading on the festival of Shavuot when it opens on the census of Israel, and focuses on tribal positions around the Tabernacle along with the rules regarding service of the Levite priestly class rather than the actual receiving of the Law from Mt. Sinai. A favorite trope of philosophers and religious scholars from ancient times to ours has been the concept of free choice. Does it exist as a vague tenet of traditional religious entitlement so we may feel free to question our ‘destiny’? Or is it merely a glib, convenient dodge for questionable behavior? Either way, acting upon it is never without consequences for the present or the future, both of which we like to think we can influence even if that influence may be illusory in itself. One of the stronger arguments for the consequence of interpreting the concept of free choice is found in Parashat Shemini, this week’s Torah reading in the Book of Leviticus/Vayikra. 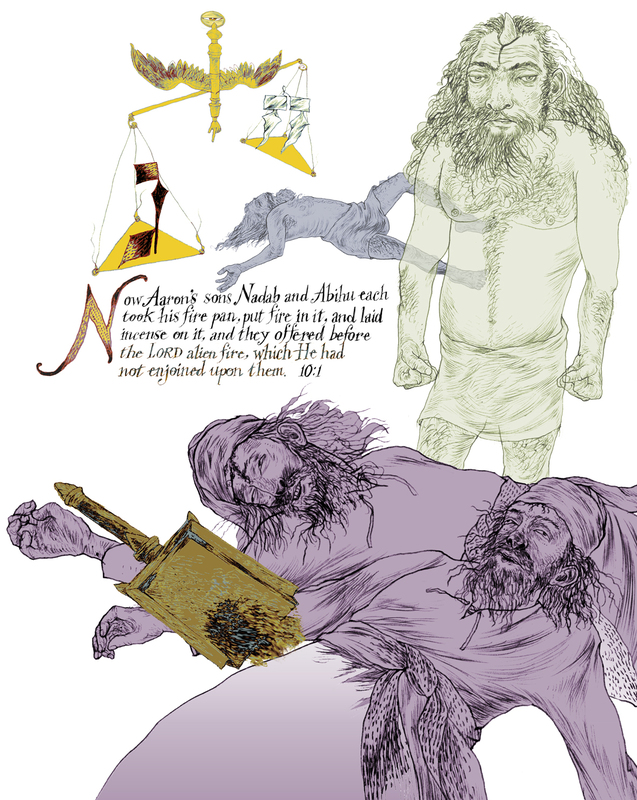 In the illustration above, called Choice & Consequence, a scale is suspended from a mystical winged yad (Torah pointer). One pan holds the sephirah of Chesed (lovingkindness) that has been damaged and unbalanced by the sephirah Gevurah, (strength and power) in the other pan. The status of these qualities lies beneath the many vivid examples of victory and tragedy in the Torah narrative. One of most heartbreaking events was the dramatic deaths of Nadav and Avihu, the sons of Aaron, High Priest of Israel. The young men were also godsons of Moses, Aaron’s brother. The Talmud and Kabbalah offer multiple interpretations of this incident. The most familiar is the brother’s unauthorized offering of incense or ‘strange fire though not requested to do so. According to Louis Ginzburg’s Legends of the Bible 1, they were killed upon their offering by two filaments of fire that flashed from the Ark in the Tabernacle. These split into four flames, pierced the nostrils of the young men and incinerated their souls. The bodies are shown intact for the legend also claims that after the event, no external injuries were visible. My imagination rode this story back to an earlier example of an unacceptable sacrifice; that of Adam’s son Cain, his rejected harvest offering and subsequent murder of his brother Abel. God’s rejection of Cain’s offering makes this tale equally tragic despite God’s vague attempt to justify his action to an angry and vengeful Cain. Though the later sacrificial system was designed to short-circuit the expression of these emotions, the loss of these young lives remains a scar on our history. One of the stranger postscripts to Cain’s murder of his brother is that God chose not to destroy Cain for his misdeed. Instead, he was condemned to live with his crime for an extraordinarily long lifetime while bearing an enigmatic stigma. Rashi, the medieval French Torah commentator asserts that this ‘mark of Cain’ was a horn that protruded from his forehead eventually causing his death by a hunter who mistook him for an animal. Another interpretation in the Zohar(Book of Splendor) associates this mark with the Hebrew letter ‘vav‘ because the name Cain or ‘qayin‘ in Hebrew, means ‘hook’.2 Was this ‘vav‘ or ‘hook’ meant to connect Cain to God during his journey towards spiritual redemption? Since both of these assertions intrigued me, I decided to combine them in one image showing Cain’s horn emerging from the ancient Hebrew letter ‘vav‘. The design of his horn was suggested by the ‘horns’ of the mizbeach or sacrificial altar. I often marvel at how everything is connected in strange and subtle ways. 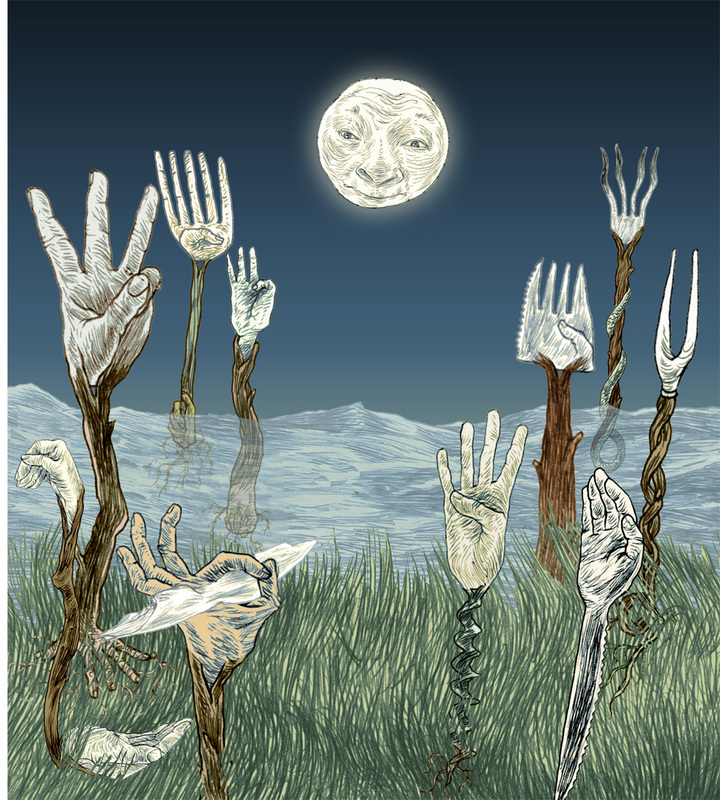 Though created as a stand-alone post, last week’s drawing, ‘Innovasion'(detail shown above) whimsically explored the theme of unusual eating utensils. Coincidentally, the other important theme in Parashat Shemini, happens to be the laws of kashrut (kosher eating practices)regarding animals; laws that clarify which animals may and may not be eaten with any utensils. In my book, Between Heaven & Earth: An Illuminated Torah Commentary (Pomegranate, 2009), the illustration for this section of Parashat Shemini, called Sanction & Censure was my final choice for the book. Yet, I thought it might be interesting to show an alternative option I considered at the time. 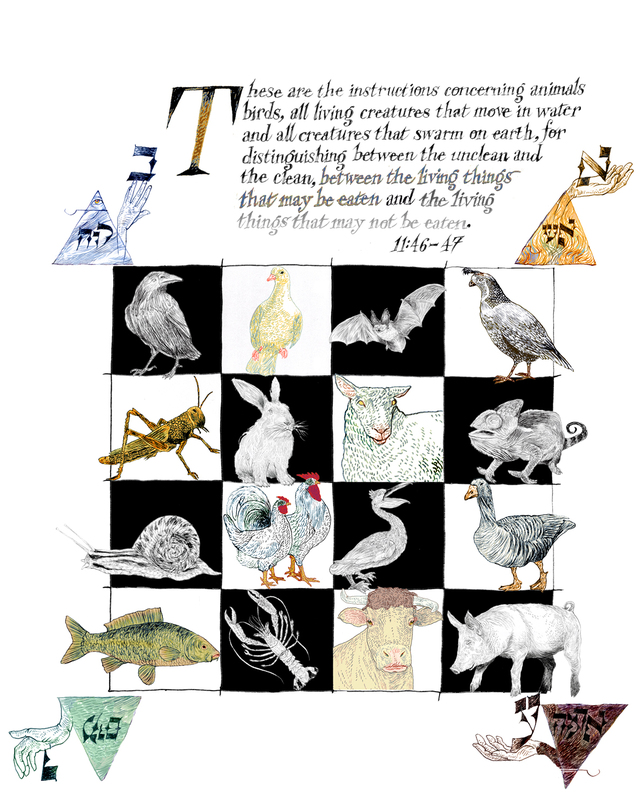 By way of explanation, the diverse array of creatures categorized in Parashah Shemini as kosher and unkosher provided an intense artistic challenge. As I began to draw these creatures, I was as delighted as a child to be depicting representatives of the vast array of life forms inhabiting our planet. Digging further into the laws of kashrut, however, these restrictions seemed way too complex to be arbitrary. I wondered about their true meaning for us beyond straightforward obedience. Though I personally understand and observe the basic tenets of kashrus, my imagination is simultaneously attracted to the esoteric. So, upon closer examination, if the animals I have drawn seem to have unique personalities, they do. Their ‘personalities’ were suggested by the Hasidic idea that each creature deemed ‘kosher’ contains ‘sparks of holiness’ and that when properly blessed and eaten, those ‘sparks’ are released, inviting the Divine Presence into our material world. Accordingly the creatures appearing fully colored underscore this idea. Those appearing in neutral grey tones within the black chessboard grid are considered inappropriate to be eaten and for the performance of commandments (mitzvot). 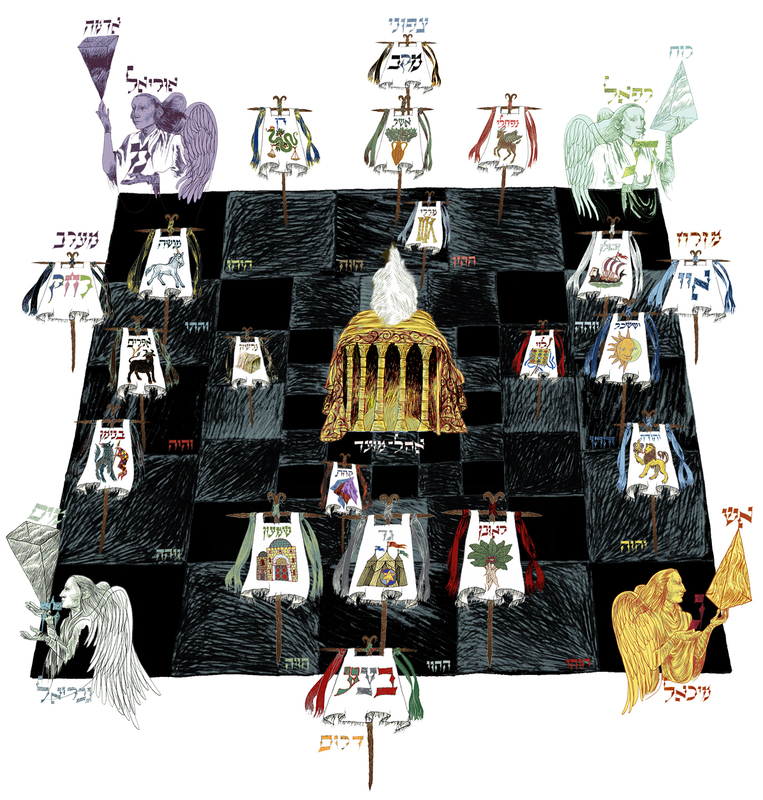 Surrounding the ‘chessboard’ are emblems representing four of the spiritual worlds (atzilus,beriyah,yetzirah,asiyah) and elements associated with them (air, water, earth, fire). I thought these should remind us that free choice may not exist merely to reassure our need for independent thinking, but rather we should understand it as a way to reaffirm our connection to creation and to each other. Since 2012, corresponding to the Hebrew year 5773 is a leap year, several of the fifty-four Torah portions are read together so that the differences in these calendar systems may be reconciled. This week, we pair reading of the final two chapters of the Book of Exodus, VaYakhel and P’kudey. Commentary for the images in this post are from my book, Between Heaven & Earth: An Illuminated Torah Commentary (Pomegranate, 2009). 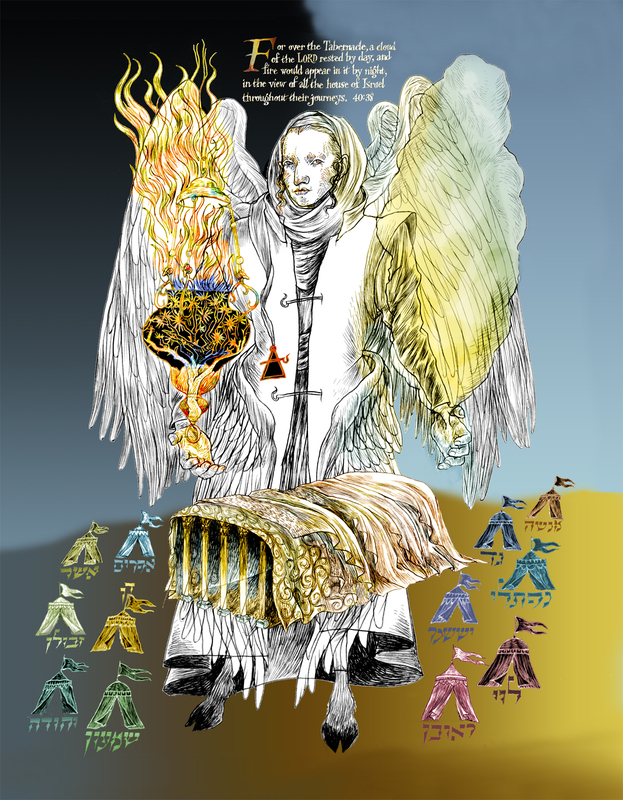 With Divine Spirit, above, again shows us the master artisan Bezalel working to complete his design and construction of the desert Tabernacle (Mishkan). Here,he is holding one of the results of his ability to permute the letters of the alefbet. The object is the Choshen, the breastplate to be worn by Aaron, the High Priest for the services in the Tabernacle. It is described in one of the sections of a work called ‘Choshen Ha-Mishpat‘ (Breastplate of Judgment) and with some reservations is attributed to the 13th century rabbi and scholar Bahya Ben Asher. The Choshen‘s threads are of crimson red, purple and blue, the three signature colors of all fabrics used in construction of the Tabernacle and priestly garments. Woven into it are twelve stones set into gold frames, each engraved with one of the names of the twelve tribes of Israel. They are arranged in the birth order of Jacob’s twelve sons and in four rows of three stones. Each row is in honor of the Four Mothers, Sarah, Rebecca, Rachel and Leah. According to Louis Ginsberg’s Legends of the Bible, Bezalel had the assistance of a special creature to construct these items. It was the tiny Shamir, (shown above Bezalel’s right arm) a worm-like creature that appeared in the evening of the sixth day of Creation. The Shamir was endowed with the unique ability to cut through impermeable materials like gemstones. Beneath the Shamir worm are two objects called the “Urim v’ Tmimim.” The appearance and function of these objects have generated much conjecture. Generally known as ‘oracle stones’ they were placed in the fold of the High Priest’s breastplate. Their alleged prophetic powers allowed him to focus on a specific problem or situation. He would then either obtain a vision or perceive combinations of letters with which he could determine the solution. Behind Bezalel stands Oholiab, son of Ahisamach of the tribe of Dan, the co-worker assigned to him by God. The scales on his worktable symbolize his tribe and his honest artisanal skills. Oholiab is preparing the gold plate (reading “Holy To The Lord”) that will be attached by a blue cord to the High Priest’s helmet (on the table to his left). Finally, the ‘Parokhet’ or inner curtain for the front of the Ark of the Covenant is shown in the background. According to Parashah T’rumah, “You shall make a curtain of blue, crimson and purple yarns, and fine twisted linen; it shall have a design of K’ruvim worked into it.” Though I have included the specified colors in the image, I have also taken artistic license with the background of the curtain by adding the apotropaic eye in the center. 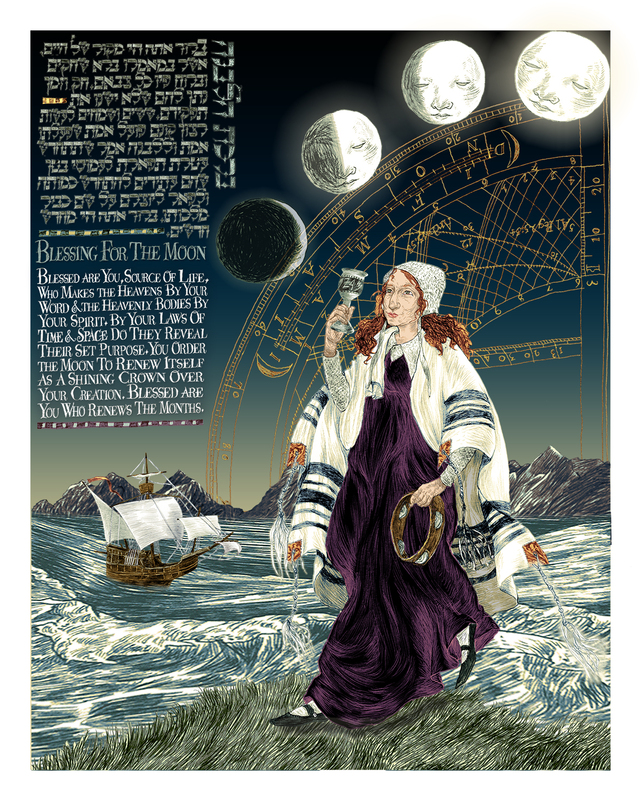 In The Wedding Of Heaven And Earth, above, under the canopy of Heaven, the Shekhinah, God’s feminine aspect, lifts her hands to bless the people in this symbolic ‘marriage’ between God and Israel. The ‘Bridegroom’ in this union is the Ark of the Covenant. Shekhinah wears the Crown of Paradise with golden pomegranate trees. Her sephirah of Malkhut or earthly monarchy is prominent at the base of the crown. A tiny chuppah adorns the large ceremonial wedding ring held aloft by the K’ruvim on the Ark. Her ‘feet’ resemble the cloven hooves of a calf from the bizarre four-faced ‘Chariot’ creatures in the Prophet Ezekiel’s vision. The full description of this vision appears in the haftorah reading for the Festival of Shavuot. Below, The Guardian Of The House of Israelimage concludes the Book of Exodus. It depicts the completed Tabernacle (Mishkan) in the desert surrounded by the tents of the Twelve Tribes of Israel. The color of each tent reflects its corresponding gemstone in the High Priest’s Choshen (Breastplate). 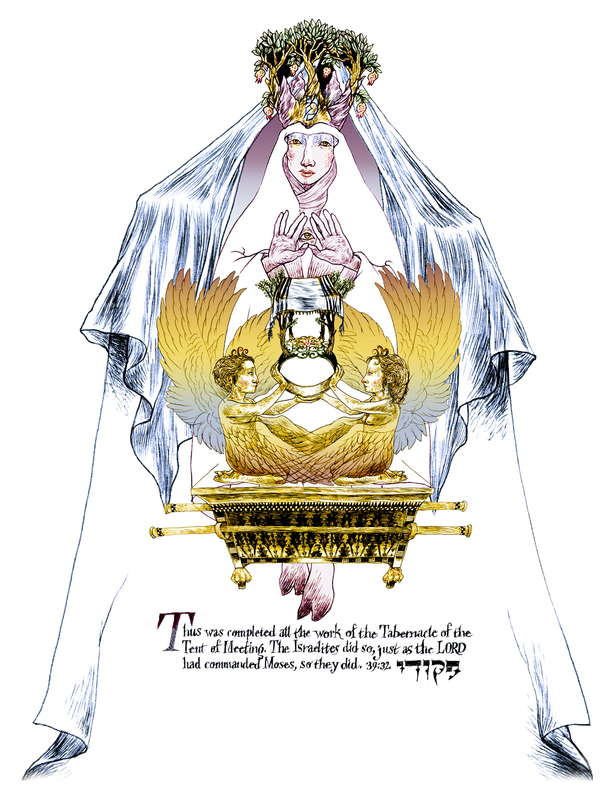 Although the text of this Parashah initially seemed to require two illustrations, I imagined an enormous angel bearing both symbols of God’s Holy protection. He wears a head covering that resembles a medieval liripipe. Suspended from its ‘tail’ is an alchemical glyph representing two elements of Creation: air and fire. 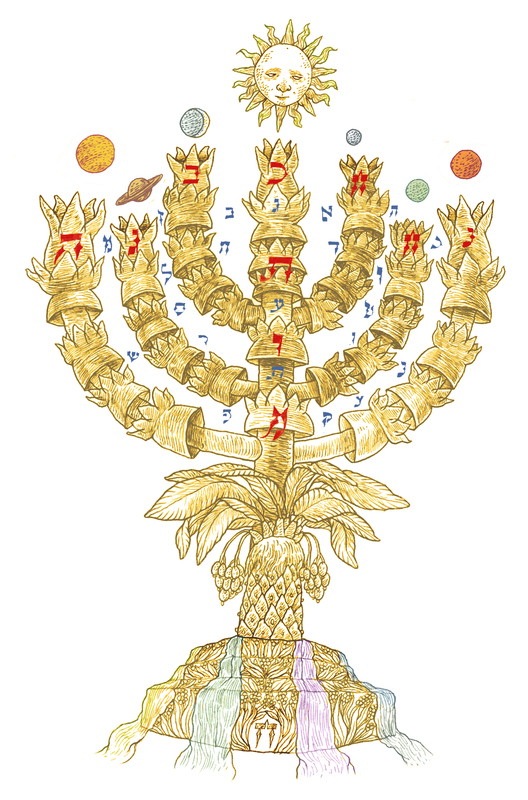 Finally, I have shown the Pillar of Fire in the form of a Ner Tamid or ‘Eternal Light. The burning bush within recalls the Covenant at Sinai while its chains incorporate the heads of korbanot (Temple offerings). The Ner Tamid has occupied a place of honor over the Ark in synagogues worldwide illuminating our memories of the original Tabernacle that guarded and inspired our ancestors three thousand years ago. 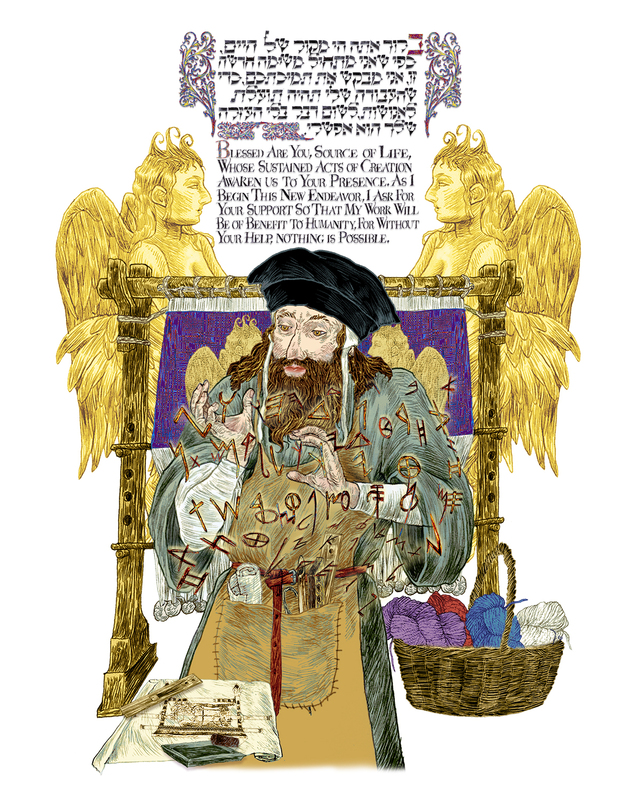 Of all the fifty-four parashiyot in the Torah, Ki Thissa was the one that spoke most eloquently to me as an artist and illustrator, particularly as it relates how Moses transmitted instructions for building the desert Tabernacle (Mishkan) to the artist and craftsman Bezalel ben Uri. I was drawn to this story many years ago as I sought to understand the levels of meaning within the Second Commandment prohibiting the creation of graven images. In essence, it opened my eyes to the concept of hiddur mitzvah or the creation of beautiful objects to enhance the worship experience, rather than be worshipped as objects in themselves. In The Shadow Of God is drawn from the Hebrew translation of the name Bezalel, given to him at birth by his father Uri, son of Hur from the tribe of Judah. 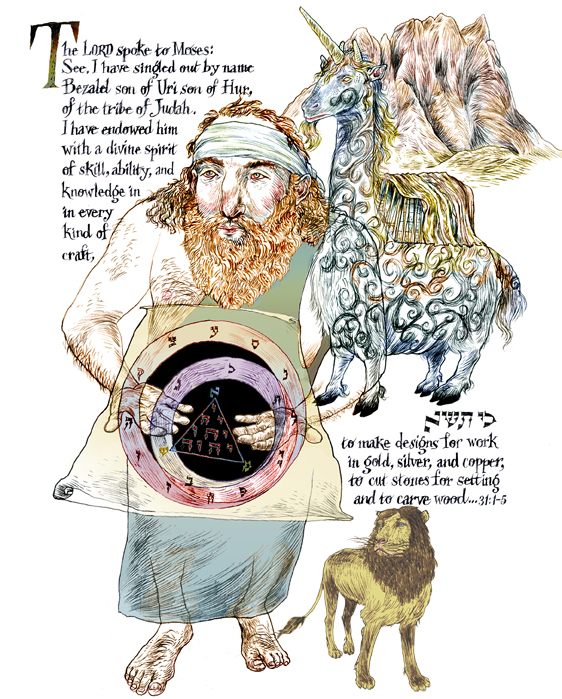 (Note the image of the Lion below the text next to Bezalel; it symbolizes the tribe of Judah) His full name reads, ‘Bet-Zal-El Hayaita which means ‘you were in God’s Shadow’ explaining his extraordinary artistic skills and closeness to the Creator so that he could envision the Heavenly Temple and accurately follow the directions for the construction of its earthly counterpart. He was tasked with this mission by Moses who transmitted God’s request upon his return from Mt. Sinai. In the Mishnah,Bezalel is credited as the man who was able to comprehend and configure the letters from which Heaven and Earth were created for this holy task. According to the Baal Shem Tov, founder of Hasidism, “All things were created through the combinations of the 22 Hebrew letters.” The open scroll that Bezalel is holding reveals a kabbalistic diagram, found in the Sefer Yetzirah, composed in 6th century Babylon, which connects letters in the Hebrew alefbet with the seven planets and twelve signs of the Zodiac. In the center of the diagram is a triangular form that contains the Tetragrammaton, an acronym for one of God’s Names. To avoid a disrespectful rendering of this name, a portion of one of the letters has been removed. At the corners of the triangle connecting it to the outer rings are the three Mother letters, alef, mem and shin that represent the elements air, fire and water. Although many graphic variations of these concepts can be found in the books of mysticism, I chose this particular diagram for Bezalel, as it seemed to invite creative interaction. Standing behind the craftsman with a model of the Mishkan on its back is a strange beast called the Tachash. The word ‘tachashim’ in parashah T’rumah, though translated as ‘dolphin skins’ finds a different interpretation in the Mishnah, which alludes to the creation and existence of this animal for the express purpose of providing materials for the construction of the Tabernacle. When its purpose was completed, it seems to have vanished.